The Ball Cemetery began as a private family cemetery and its oldest grave marker is dated 1869. Over the years, the cemetery grew to include individuals such as William "Rattlesnake Pete" Liddiard, a United States Marshal and implement dealer, who left his home of Springfield, Nebraska to join up with William “Buffalo Bill” Cody. He had a large handle bar mustache and became known as one of the fastest “on the draw” of all the U.S. Marshals. When he later died on the West coast, his body was brought back to Ball Cemetery for burial. Various apparitions have been seen at Ball Cemetery. The ghost of a tall, male figure has been seen walking around the cemetery after dark. This ghostly apparition is known to have a rather bad temper, and there have even been reports of phantom, physical attacks dealt to some of the people who dare to visit this cemetery late at night. Other visitors have found unexplainable bruises on their arms and legs after entering the cemetery. Could this be the work of Rattlesnake Pete? Another spirit roaming this cemetery by night is thought to be Mary Mumford, one of Ball Cemetery’s interred residents. Visitors have reported hearing the faint voice of a woman emanating from somewhere in the cemetery and some have even felt their clothing being tugged, followed by a woman's laughter. More strange happenings at Ball Cemetery include those who say they have witnessed headstones tipping over and then rising back up on their own, and strange ectoplasm mists appearing in photographs taken among the gravesites. 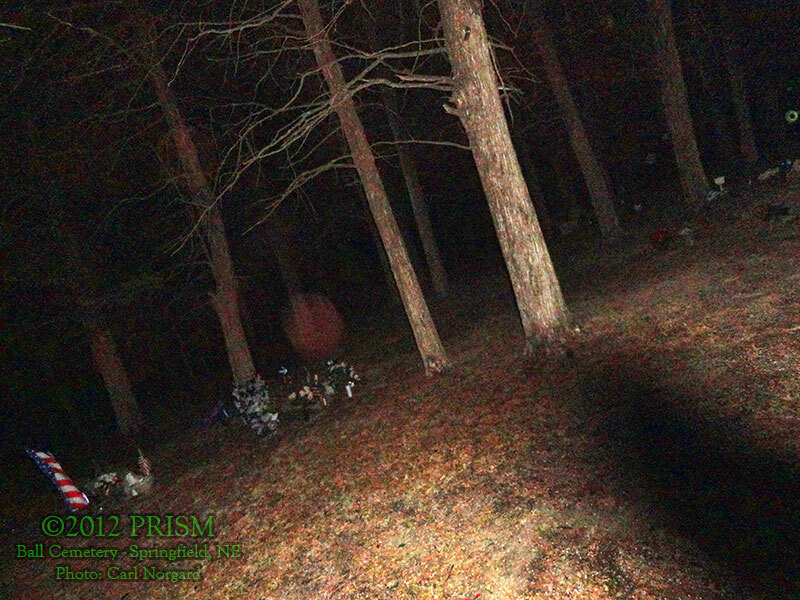 In August 31, 2012, the PRISM paranormal research returned to Ball Cemetery. At approximately 9:00PM PRISM investigators Carl Norgard, Kelley Kennedy, Lisa Krasso, Brian Heath and a guest investigator, met with a Sarpy County Deputy who escorted the team into Ball cemetery. The short turn around gravel road going into Ball Is dark and tree lined and made for a appropriate start for the investigation. PRISM stayed at the cemetery for 3 hours taking many photographs and audio recordings. Unfortunately, due to the the light rain that fell during most of the investigation, most of the photos had to be discarded. After going through the evidence, one full spectrum photo of a shadow and one EVP were captured. On April 3, 2005, PRISM's David Pierce Rodriguez and Dan Christianson spent a short time at Ball Cemetery. The cemetery gates were closed this night, so both investigators had to take their photos, video, and EMF readings from the outside of the fence which lines the cemetery. No unusual EMF readings were recorded. One EVP and light anomaly were recorded on a handheld video camera and lots of extremely large orbs were photographed by both David and Dan. Neighbors were notified of our presence in advance, so we weren't afraid of getting shot at, but even so, there was definitely a "creepy" feeling in the air around the cemetery. Huge orbs photographed floating around the grave sites around Ball Cemetery on April 3, 2005. This EVP was captured on a Sony TRV video camera with NightShot by David Pierce Rodriguez and Dan Christianson on their April 3, 2005 investigation of the Ball Cemetery in Springfild, Nebraska. A blinking light can be seen fon the upper left side of the video clip while an EVP is heard at the same exact time. What the voice is saying is unclear. This photograph from March 25, 2005 shows what appears to be ectoplasmic mist hovering over one of the graves in Ball Cemetery. ​Photo: PRISM | Jim W.
A very interesting light anomaly captured on June 7, 2004 on a 35mm camera by one of the gravestones in Ball Cemetery. Photo: PRISM | Adam M.